Dr. Sally Springer is a psychologist with more than 25 years of experience as a university professor and college administrator. 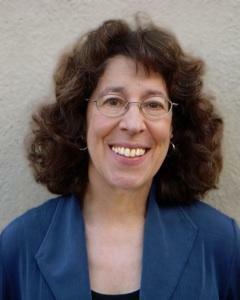 The author of several psychology books, Dr. Springer focuses on the college admissions process in her latest book, covering information ranging from when to apply to schools to how many should be on your list to how to maximize your chances of getting accepted. 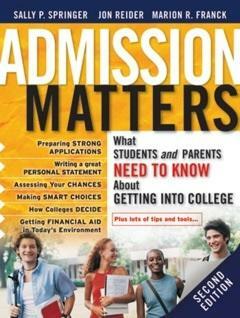 Written for both parents and students, Admission Matters is an excellent resource on the topic. Dr. Springer shares insights into the college admissions process in this exclusive interview with LoveToKnow College. LoveToKnow (LTK): Can you tell us a bit about your motivation for writing this book? Sally Springer (SS): Admission Matters was written to help students and parents navigate an increasingly complex college admissions process. When I started, there were lots of books and other resources available, but a lot of the information was wrong, out of date, or just plain cynical in its approach to college admissions as a game that you could either win or lose. I was particularly troubled by the cynicism since I didn't--and still don't--think that it is a healthy message to send to young people at a critical point in their development. I began writing a book that would be accurate, realistic, and reassuring. I was delighted by the response to the first edition because it was clear that it met a real need, and [I] was happy that a thoroughly updated second edition came out in 2009. LTK: For whom is your book? SS: I am especially proud of the fact that Admission Matters is written for both parents and students. We want students and parents to read all of it and have a common understanding of the admissions process and what their different yet complementary roles should be. Admission Matters demystifies the college admissions process and tries to level the playing field for those without access to extensive assistance from knowledgeable high school counselors. It is also written for those who have access to good counseling but who would still like some extra help. LTK: What does your book provide? SS: The book gives lots of very useful, very practical information about how to prepare for college, how to research colleges, and how to prepare strong applications. We have lots of helpful checklists [and] questionnaires. But it is much more than a "how-to" book. Admission Matters is designed to provide readers with important insights to put college admissions into perspective, both as a process and as a part of life, and to keep the "if only I had known earlier" regret to a minimum. LTK: When should students begin the application process? SS: Junior year in high school is a good time to begin serious research about different colleges to help develop a list of good-fit schools. If feasible, spring break can be used for college visits. Research and possible visits can continue through the summer as well. Getting a head start in the summer on application essays, if required, is also a great idea. I know, though, that many students leave the entire process, including researching colleges, to the fall semester of senior year. That can work, but it is not ideal, and it can make things unnecessarily stressful all around. LTK: To how many schools should students apply? SS: The size of a college list will vary from student to student, depending on the student's record [and] the kind of schools he or she is interested in. But, in general, counselors recommend six to eight, including a couple of schools where the student is virtually assured of admission. LTK: How can students balance the financial side of the application process? SS: It is important for students and parents to understand the difference between need-based aid and merit aid, and it can be very helpful for parents to use one of the financial aid estimators available on the Web to get an idea of how much money schools will expect them to contribute to the student's education. The College Board has a good online estimator. Schools that award merit aid in addition to need-based aid can be attractive options for students whose families have a high "expected family contribution." The most generous merit aid, however, is generally awarded to the students a college most wants to attract, so it is wise to consider colleges where the student's record would place him or her in the top 25 percent of the freshman class. LTK: Are all application materials (essay, test scores, grades, etc.) equally important? Does this vary by school? SS: Each school has its own process for selecting its freshman class. Some schools base their decisions on a student's "stats," while others use a comprehensive approach that looks not only at numbers but at soft factors that may include extracurricular activities, essays, letters of recommendation, interviews, [and] challenges that were overcome. But almost all schools, with the exception of specialized schools that admit students primarily on the basis of their talent in music or another artistic area, will say that the heart of the application and what gets the greatest weight is the student's academic record: the courses taken and the grades achieved in those courses. LTK: How is applying for college different now than it was 25 years ago? SS: A lot of factors contribute to the sense that college admissions has changed a great deal in the last 25 years. There are more students applying to college than ever before, and at the same time, the Internet has made it vastly easier to learn about colleges as well as apply to them. So you have more students applying to more colleges, contributing to the general sense that it is getting harder and harder to be admitted. On top of all of this, you also have the financial turmoil that has faced our country, affecting the ability of many families to pay for college as well as the ability of many public colleges to accept as many students as they have in the past. The anxiety level is just much higher overall. LTK: If you could give only one piece of advice to parents whose children are starting the admissions process, what would it be? SS: Oh, this is a hard question to answer! If I had to pick just one, it would be to tell parents that what their child will remember long after the college admissions process is over is how they supported him or her. Ideally, they want to be able to look back after the final college choice is made and savor the knowledge of having provided emotional and practical support for their child that contributed to a successful outcome. But that doesn't mean taking over; the student has to "own" the process. LTK: What is the single most important piece of advice you would give to the students themselves? SS: It is a little easier to answer this one. Students should remember that the most important part of the college admissions process is choosing colleges that would be a good match. They need to be honest with themselves about their interests, preferences, strengths, and weaknesses as they learn about colleges. They need to do a careful self-assessment, not rely on rankings or simply what their friends are doing, and keep an open mind as they explore possible colleges. They need to develop their list of potential schools carefully and realistically. Dr. Springer's advice is important for both parents of teenagers and students who are getting ready to start or have already started the process of applying for higher education. Whether you hope to receive an acceptance letter from the Ivy League or a local public university, learning how to best complete the process takes a little time and patience. For support throughout the process, consult Dr. Springer's book, available locally as well as from Amazon. Dr. Springer also runs a consulting practice, Springer Consulting, where she provides personalized advice on the admissions process. Whether you need help with choosing schools or finding financial aid and scholarships, remember that while it can be overwhelming at first, the college admissions process is the first step to embarking on a great adventure: earning a college degree!